Problem #1: The fiberglass batts almost always start falling out over time. 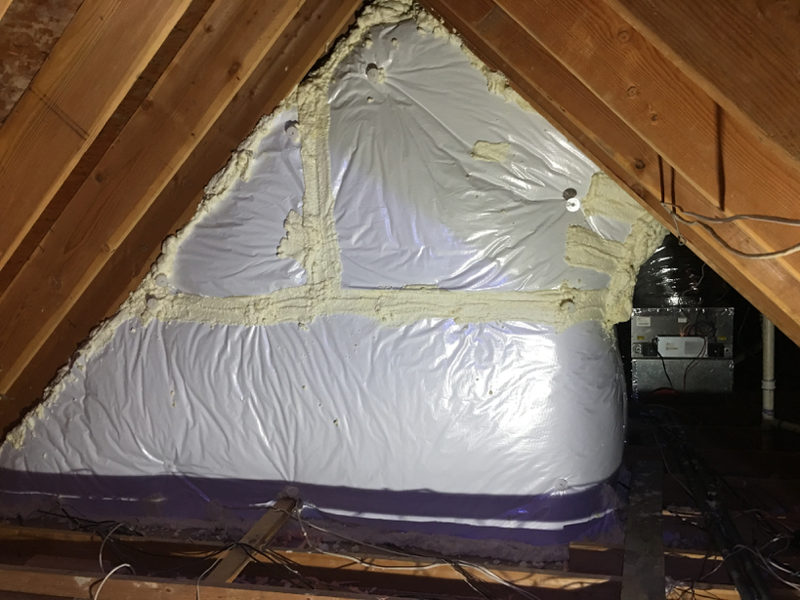 This let’s the cold or hot attic air behind the insulation rendering it completely useless. Ever try staying warm by holding a blanket 4” from your skin? Same problem here. Notice all exposed bare drywall. Drywall’s R value is only .45. It is virtually just a bed sheet between the conditioned space inside and the attic temperatures. 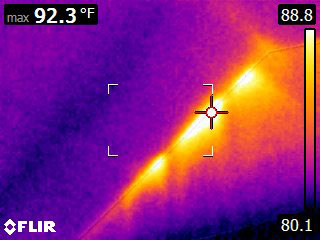 When we look at the walls with a thermal camera…. Wow. 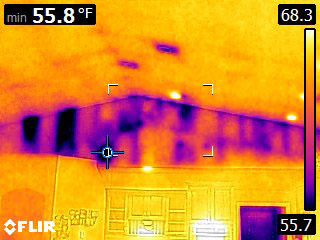 Notice the temperature on the INSIDE of the sheetrock is 111 degrees. It is no wonder this customer was uncomfortable in their bedroom. This was our home shortly after we purchased it. It was built in 2006. It was a cold winter until we freed up enough time to address it. 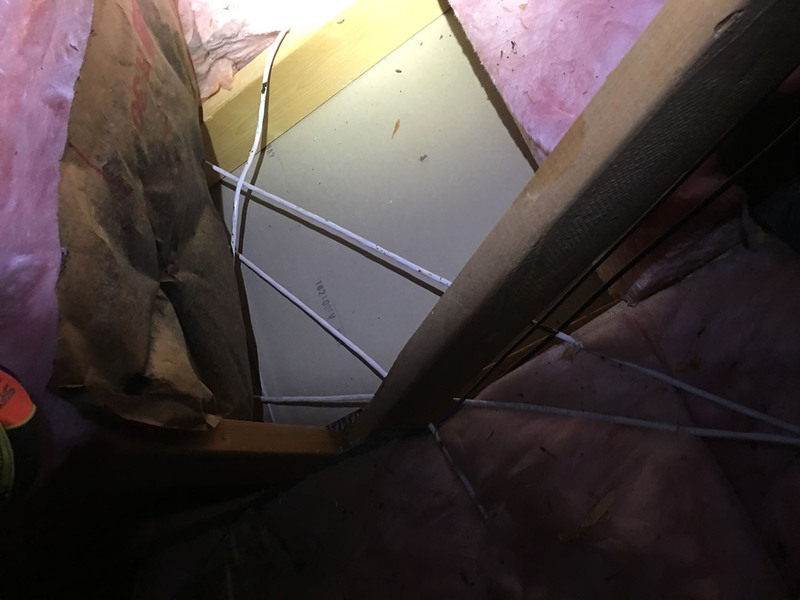 Problem #2: When the fiberglass batts were installed, they were laid perpendicular to the wall studs and/ or across wiring. 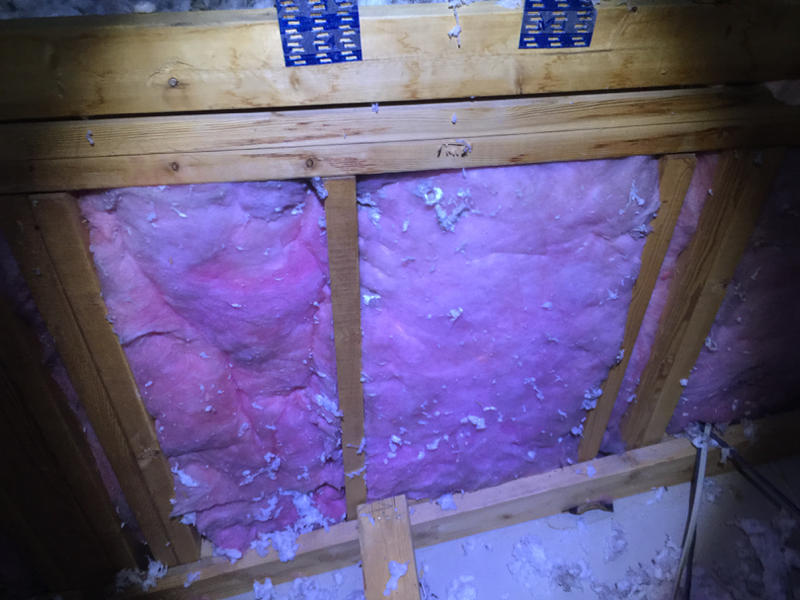 This “throw and go” method of installing fiberglass batts leaves the dreaded air gap again. 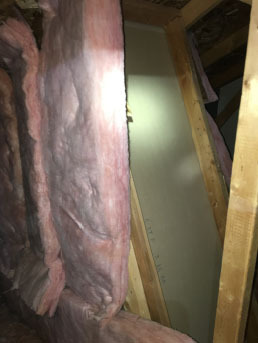 We cannot have any air gaps between the insulation and the drywall. 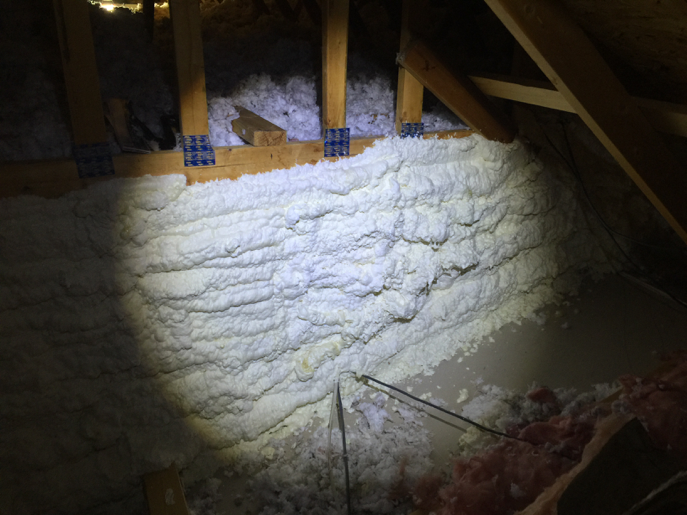 This fiberglass batt was laid across wiring and perpendicular to the studs. I’m not sure if the original installers even owned a knife. 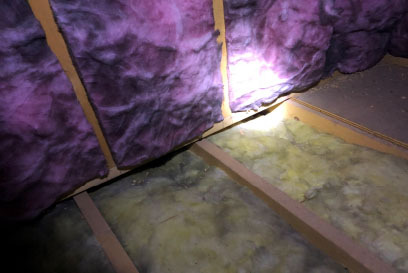 Problem #3: When air moves through fiberglass batt insulation, it significantly reduces it’s R value. Much like wearing a sweater on a windy winter day. The air moves the heat away through convection. If we put a wind breaker on over the sweater, which has almost no insulation value, it stops the air and allows the sweater to do it’s job and slow conduction. 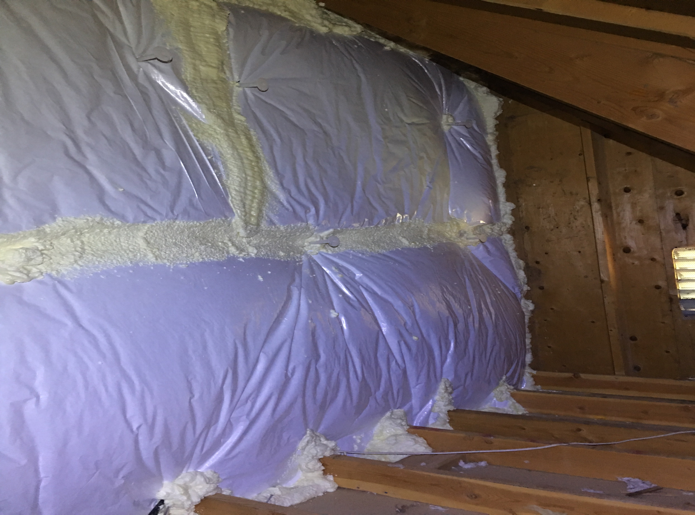 Hot air is moving down the knee wall and through the fiberglass batt insulation itself. The hot hair is reducing the insulations’ ability to slow conduction. 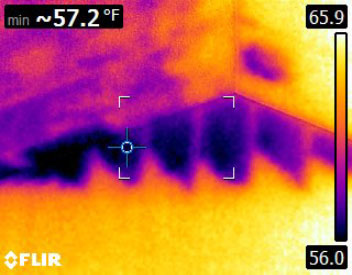 This thermal picture shows how the fiberglass batts being exposed to the very cold attic air has almost rendered it useless. 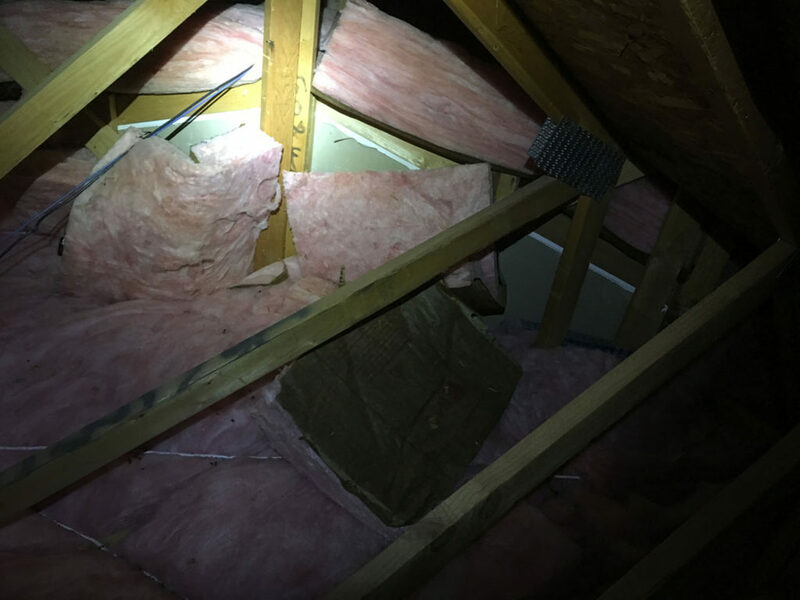 The triangle shape at the bottom is from the existing blown in loose fill insulation that has been blown up against the wall. Problem #4: Fiberglass batts fit between the studs. What about insulating the studs? Wood is a great conductor of heat. It is approximately an R1 per inch. 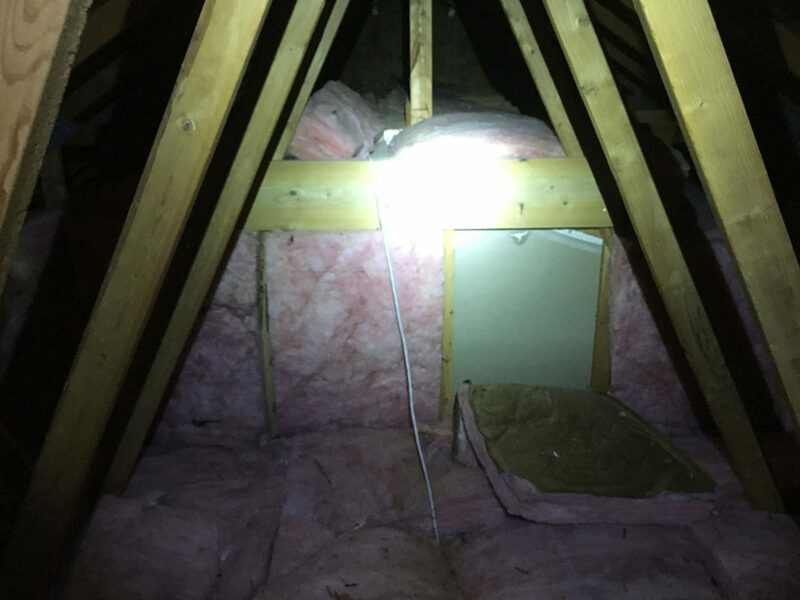 When the insulation is blown in on the attic floor, all of the joists are covered and well insulated. Not so on these knee walls. It is very easy to see where the studs are on this knee wall. As a comparison, we can just barley see the horizontal ceiling joists. 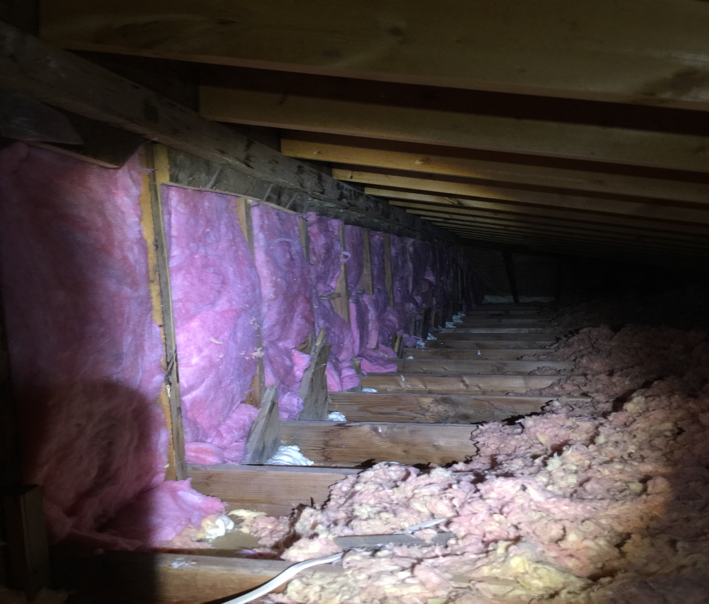 They are covered by the blown in insulation and are insulated form the attic temperatures. 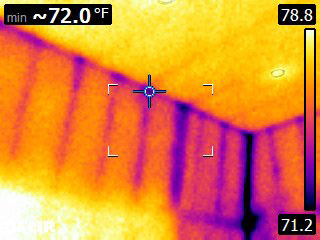 We can see the studs on this knee wall are all exposed to the attic temperatures. Also, the bottom of the knee wall is open to floor joist cavities. This is allowing air to move freely between the second story floor and ceiling below. Ensure the entire stud cavity is filled with insulation. No air gaps at all. The fiberglass batts are not compressed and are all properly fitted. 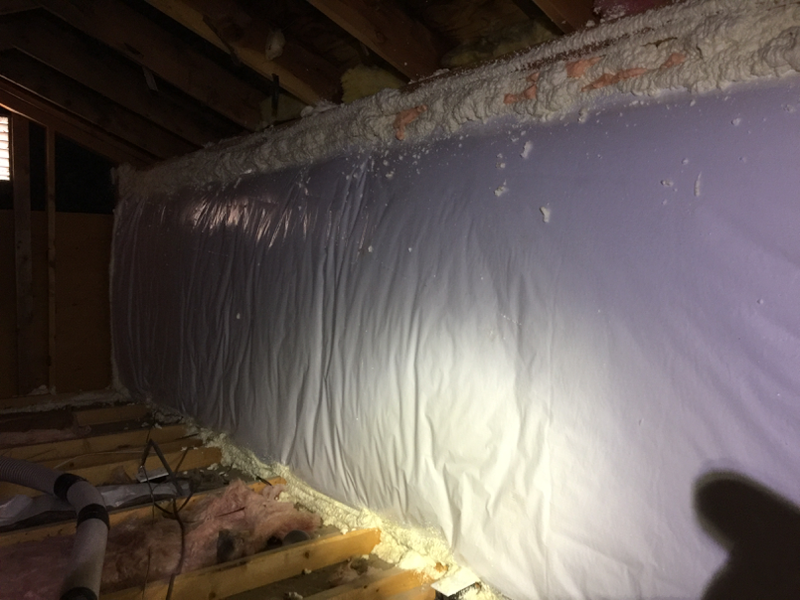 Add an air tight fiberglass blanket or encapsulate with two part closed cell spray foam? Step 2: Seal and insulate either with a fiberglass blanket or encapsulating with Closed Cell SPF. Blanket method: This is an R19 6” Fiberglass blanket with a white trilaminate air tight facing. This blankets do not have the vinyl or “diaper” facing. The vinyl facing just does not hold up over time. All of the seams and the perimeter have been sealed. This adds an additional R19 to the wall, insulates all the studs to stop any thermal bridging and provides an airtight assembly. By adding an R19 to the existing R13 cavity insulation, the knee wall assembly total R value is near R30 and is air tight. This knee wall has been encapsulated with 2 part closed cell spray foam. At an R6 per inch, it provides an air barrier and outstanding thermal break. One downs side to spray foam down side is cost. Spray foam, or SPF, has a high material cost in comparison to traditional materials. We have found that both methods work equally as well in this application (with a few exceptions). The key is that the blankets are sealed air tight. I know this is repetitive, but I cannot stress this enough. We have seen quite a few poor installations with good intentions. We have seen poly sheeting used as an air barrier, Thermoply and rigid foam. 99% of them allowed a lotof air in did a very poor job improving over the existing insulation. I’m going to brag a bit here on our crew. They make these blankets look better than I can make my own bed. 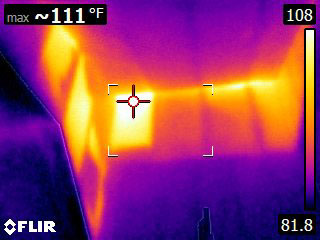 When we look at these knee walls with a thermal camera, they look perfect. There isn’t any thermal bridging or air leakage detected.